No wiring needed! 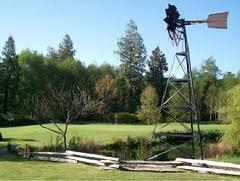 Galvanized steel windmill packages can effecively aerate up to a one-acre pond (15' deep) with as little as a 5 mph wind. Each package includes a base, mounted diaphragm compressor, 12 blade 65" diameter rotor and 100' air line. The freeze control option with 2-gallon tank (NLW1) helps to prevent air line freeze-up.